Serve this Cheesy Baked Shrimp and Spinach Dip at your next party and it’s sure to be the first dish devoured! My friends and family BEG for this easy cheesy appetizer! I sometimes joke that I should rename my blog PEAS AND CHEESE since my recipes tend to gravitate towards all things cheesy. Though who wants to think about cheese and peas together!? Eek! Hard pass. CHEESE AND CRAYONS is always an option I suppose… Nope. That’s even weirder! I think I’ll stick with the moniker I chose for this little blog baby of mine nearly 8 years ago. There are a bevvy of veggie-spiked healthified versions of both cold and hot spinach dips already in rotation around here but I would be failing you terribly if I didn’t even things out with the most luscious, indulgent, lick-the-skillet-clean spinach dip ever to grace your table. Or your friend’s table. Sharing is caring! This dip is INSANE. It’s bonkers in the best way possible! If you’re serving a crowd you’ll want to do yourself a favor and print out a few copies of the recipe to hand out to friends. Once the bowl has been licked clean, people are going to straight-up hound you for it! 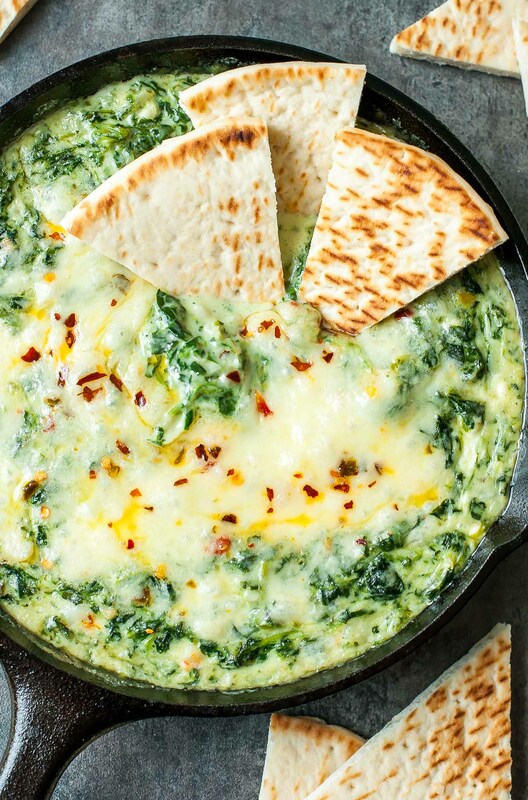 To ensure maximum spinach consumption, I spiked this skillet sensation with not one but TWO packages of velvety spinach then swirled it with a combination of cream cheese, Havarti, and Parmesan… a trio that’s sure to make you weak in the knees! Because I rarely make a traditional recipe around here, the base for this recipe is sautéed onion, garlic, and SHRIMP! 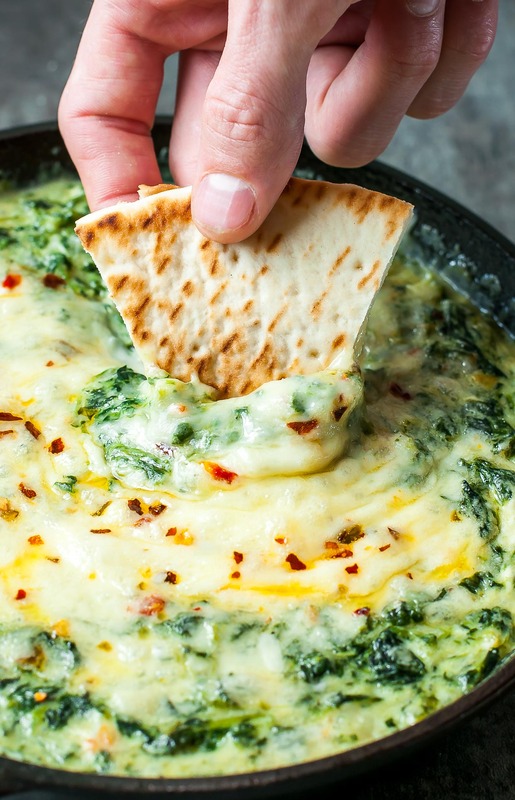 Living on the Gulf has taught me that the one surefire way to make bubbly hot spinach dip even better is to add a little seafood to the mix, it’s fantastic! 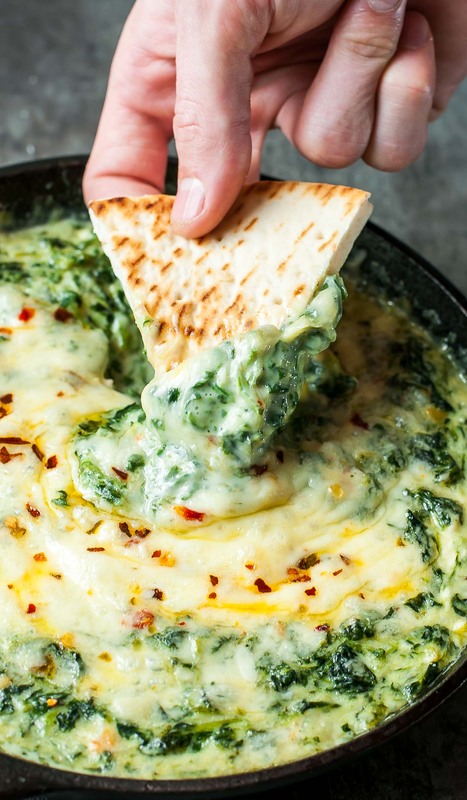 Luscious Havarti cheese combined with the tasty trifecta of sautéed onion, garlic, and shrimp delivers a punch of flavor to this incredible spinach dip! My friends and family literally beg for it, and when you make it for your next party you’ll see why! 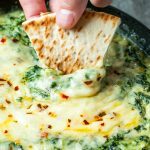 Bubbly hot spinach dip with a tasty twist! Everyone BEGS for this recipe! Thaw spinach as desired. I heated mine using the microwave but you can also leave in the fridge overnight to defrost. Easy peasy! Squeeze frozen chopped spinach to remove excess moisture then combine with creamed spinach. Bring an 8-12 inch cast iron skillet to medium-high heat, then sauté onion in 1 TBSP butter or oil, adding minced garlic towards the end to prevent burning. Add the shrimp and sauté for a few additional minutes until the shrimp turn opaque. Season with salt and reduce heat to lowest setting. Add your spinach and cheeses (including cream cheese) and mix well. Re-season to taste if desired. Top with extra cheese if desired (a little extra cheese is always welcome around here!) then add a pinch of red pepper flakes. Bake for 15-20 minutes until dip is hot and bubbly. Serve with an assortment of veggies, tortilla chips, and/or pita wedges for dipping. No cast iron skillet? No problem! This dip can be cooked in your favorite pot or pan then transferred to a baking dish to reach bubbly melty perfection. Enjoy! Take the cheese-factor to the next level by sprinkling some freshly grated cheese on top of the dip before baking. You can use extra Havarti, Mozzarella, Gouda, Gruyere, or pretty much any easy-melt cheese that floats your boat! Serve with sliced veggies, tortilla chips, and/or pita wedges for dipping! Not feeling the shrimp? You can absolutely leave it out! The dip will still taste fantastic as is, so don’t fret since you can simply skip it. Gouda (skip the smoked one + grab the plain variety) makes an excellent swap as does Gruyere, Fontina, and Mozzarella cheeses. To amp up the flavor, I usually pair soft, melty cheeses like these with a sprinkling of freshly grated Parmesan cheese. Delicious! I love having a cast iron skillet on hand for hot dips like this one since it goes from stove-top to oven without the need to dirty another dish. Hello one-pot wonder! You have two delicious options: You can make the entire dip minus the shrimp a day or two in advance, then add freshly sautéed shrimp to the dip just before popping the dip in the oven to bake/reheat. You could also make the entire dip ahead of time then reheat when needed. This depends mostly on preference for fresh shrimp. Around here we’ll scarf this delicious dip any and every way! This is the best dip ever. I made this dip for a SCENTSY party and my family absolutely loved it! Ahhhh yay! Best news ever! Thank you Teresa – we love it too! Thanx Jenn! I’ve been obsessed w/ your recipes! 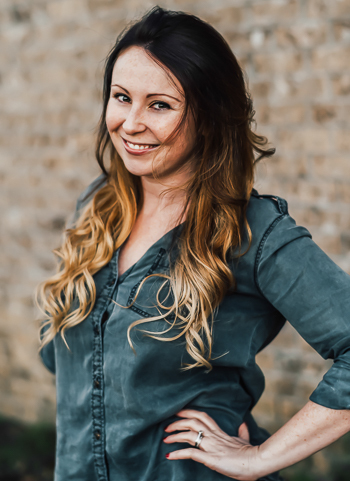 You’re truly a blog wonder!? This looks decadently delicious & going to try-immediately!! Is it just me? But exactly when do you add the shrimp? In the skillet w/ the onion & garlic? Thanx! Also love the Peas-n-Cheese!!! Thanks Jan! I’m super excited you’ll be trying it and hope you adore it as much as we do! I’m already counting the days until I can make it again! 🙂 I updated the recipe to make the instructions more clear; somehow I skipped a step. Thank you so so much for the heads up! Yum! Sounds so good. Thanks for sharing! Cheese is my favorite food group! 😉 This dip looks so good!!!!! Haha it’s growing on me =) After 2 weeks of Whole30 I’m ready to change my name to CHEESE! I cannot wait to have this dip again! Peas and cheese is actually a really good combination. I’m a big fan of peas alongside my mac & cheese. But I’ve also had straight-up cheese melted on peas. I wouldn’t knock it! This seriously looks so good! I can’t wait to make it!